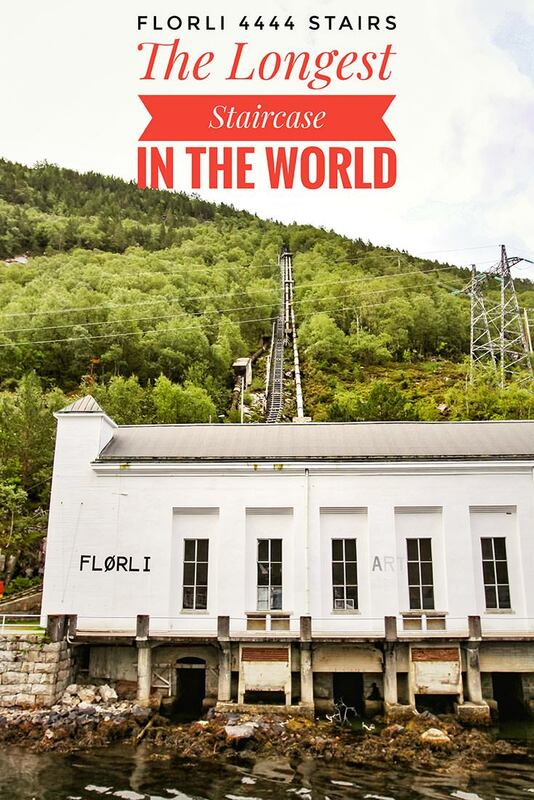 In 1918, Flørli opened as one of the first hydropower plants in Norway. It was an engineering masterpiece at the time! One hundred years later, Flørli power station might be dead, but its remarkable idea of getting the best out of nature lives on. 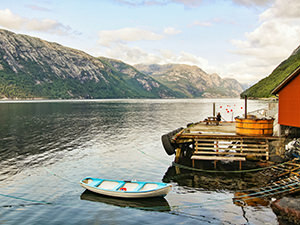 In the outstanding surrounding of Lysefjord, Flørli tourism is about to flourish! The main magnet will certainly be Flørli’s 4444 stairs hike, leading up to the exceptional views of one of the prettiest fjords in Norway. But the mere number of steps in this wooden staircase is already remarkable! Welcome to Flørlitrappene, the longest staircase in the world! If you are already short of breath when walking up to the second floor of your building, you might find Flørli stairs hike repulsive. But then, some people are literally stepping up their game to climb to the top. Flørli stairs are a measurement of achievement; they are a challenge worth ticking off on adventurer’s challenge list! No roads lead to Flørli – the quickest way to get there is to jump on the ferry! “You can’t easily leave the island”, tells me one guest from Australia. “You know we are not on an island?”, I ask. Nested in the center of Lysefjord, with scarce ferry connections, this is the world where life pace slows down. The civilization seems to be so far away, as if the large body of sea separates you from the world problems. 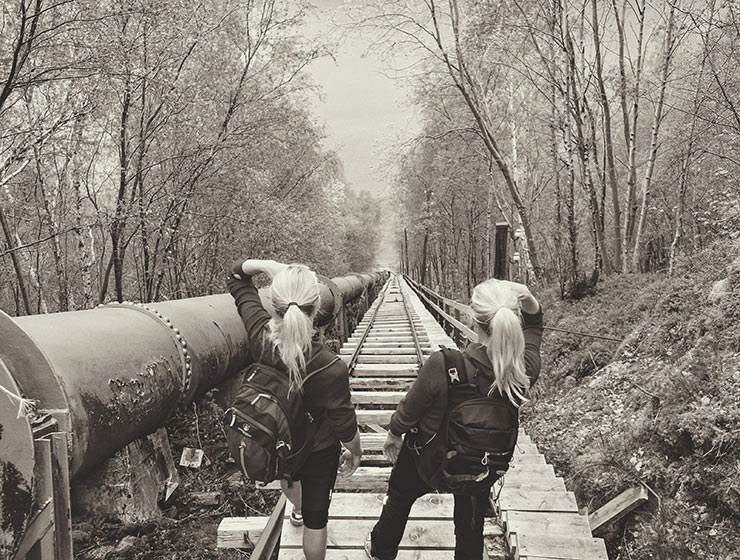 Being a roadless hamlet, Flørli is an ideal destination for those willing to explore the area by foot. Mornings at the fjord look magical, with calm mirror-like water and clouds slowly dissipating. Local sheep graze on the green hills. Their ringing bells are the main sound one can hear. You almost don’t want to leave this peaceful, idyllic scene! If you rent a canoe or a kayak in Flørli, you might meet the curious seals. If you rent fishing equipment, you might catch your own lunch, be it a mackerel, a cod or a sea-trout! Flørlitrappene or Flørli stairs are an obvious choice for testing your hiking shoes. And courage, I assume. Two sections of the stairs are a bit steeper, and people with vertigo find them challenging. In any case, climbing 4444 stairs is an intense experience, but it brings you to a little lake with crystal water. If the temperatures allow, the alluring lake is a great place to take a dip. If you decide to go down through the crooked old pine groves, the hike will take you 3 hours. 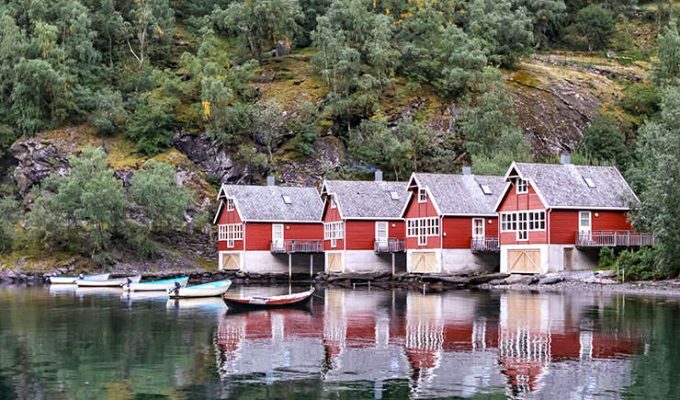 A more scenic path by the lakes in Frafjordheiane Landscape Reserve will make you finish the walk in 4 hours. Besides its famous 4444 stairs hike, Flørli offers more outdoor adventures to the hiking enthusiasts. 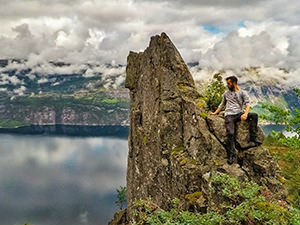 Flørneset Opp is a 1-hour hike of moderate difficulty. 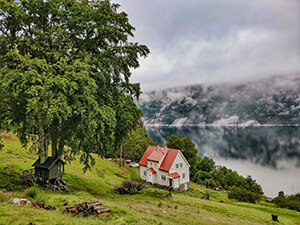 It takes you along the fjord, then follows the steep path up the hill, until the tractor road through the forest brings you back to the village. Sitting on Kallelifjellet with Lysefjord abyss gaping its mouth under you is just for the bravest! 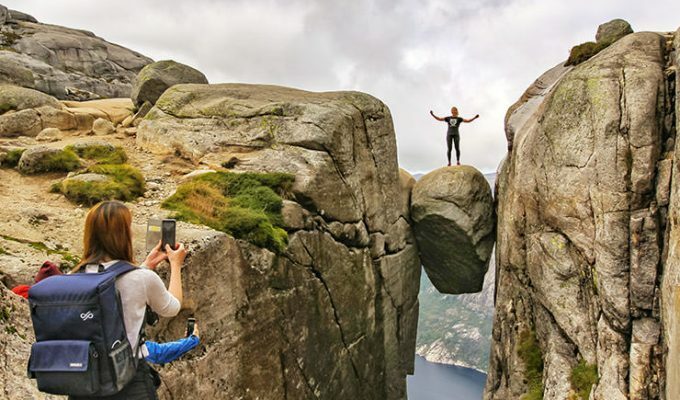 Flørli Cliff Hike is for those who prefer something more challenging. 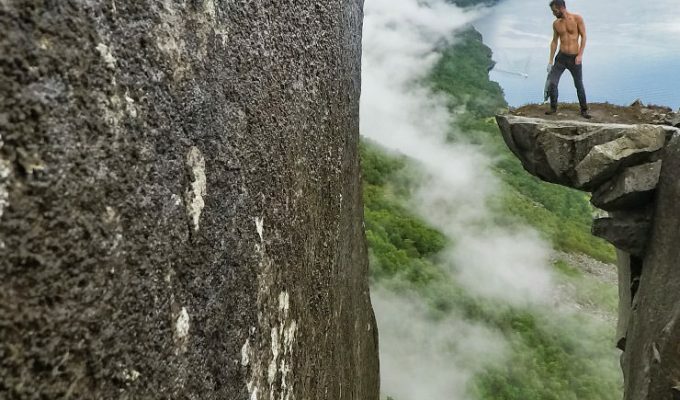 The path leads up the steep mountain crest, with some exposed sections, ending at the Kalleliklumpen, a table-sized boulder hovering hundreds of meters above the abyss. If you continue along the cliff (this path is currently not marked), you will get to Kalleligjelet and Kallelifjellet, two more rocks seducing the daredevils. Flørli Cliff Hike takes about two hours. 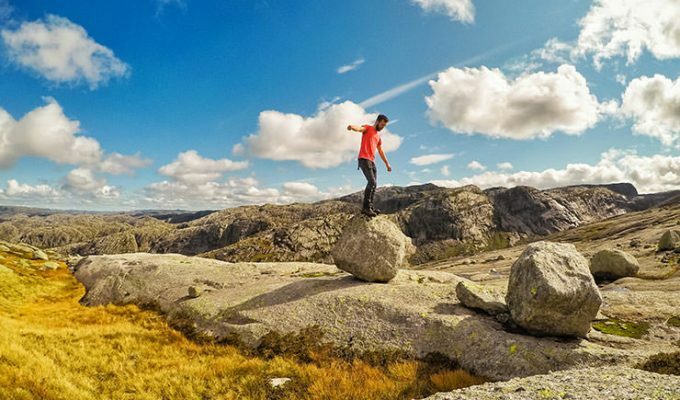 If you want to raise the challenge bar even further, you could extend climbing Flørlitrappene with a Flørli to Kjerag hike! Unless you are an incredibly fit beast, this 20-kilometer hike will take two days. 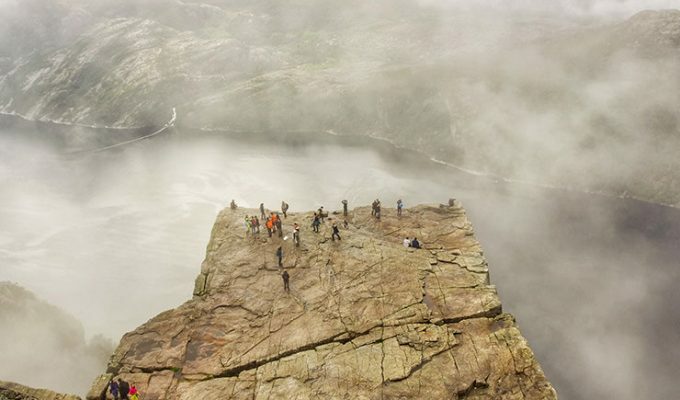 If you plan the ferries well, it is also possible to visit the famous Preikestolen from Flørli. Stepping up the 4444 stairs seems hard? Consider the fact that someone had to build them in the first place! The fall from the lake to the sea level is 740 meters. That might be great for hydropower production, but not the best news for 142 people who were constructing the plant at the beginning of the 20th century. Tons of equipment had to be brought up to the lake called Stora Flørvatnet (or Floyrlivatn). The terrain was too steep for horses, so people had to do the majority of the work. In average, a worker was carrying 80 kilos uphill on his back. The strong Helmikstøl brothers entered the legend; each of them was supposedly carrying 135 kilos! 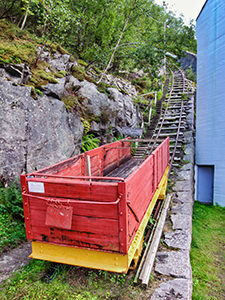 After several years, they laid the rails, and the powerful winch was pulling the trolley with people and equipment up the mountain. 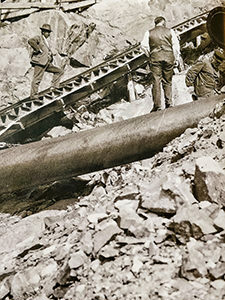 They built the wooden stairs along the tracks for water pipeline maintenance purposes. Tourism was not in the picture at all! 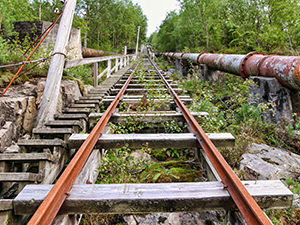 Flørli power station operated from 1918 until 1999, when they replaced it with a new, automated and more efficient station in the mountain. The last residents moved out of Flørli in 1996. In the extreme Lysefjorden weather, the buildings started to deteriorate quickly. The hydropower company had to remove them to obey the law, but the public protested. 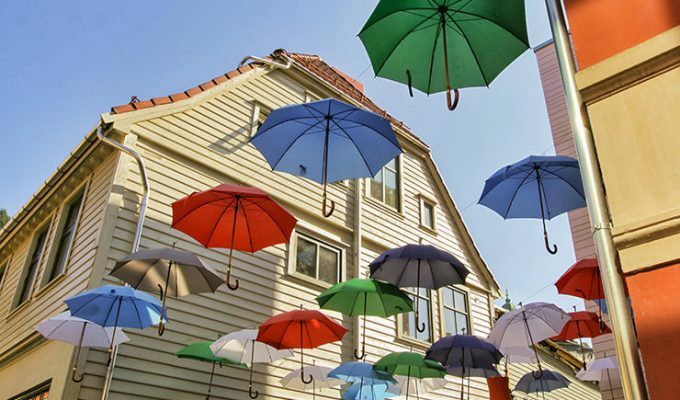 Stavanger municipality took over the place and allowed repurposing for tourism. Waking up at Flørli 4444 resembles waking up in the painting! Flørli accommodation today might be basic, but it comes with a unique setting. Hessel Haker is a Dutch expat who recognized its potential, and after leading the volunteering conservation project on some of the buildings, in 2014 he founded Flørli 4444, a tourism company that tries to preserve the history of the place while providing what he calls “the simple luxury of life” – accommodation, food and activities based in nature. There are no keys in the village! It is such a safe and relaxed environment that there is no need to lock rooms and houses! The season at Flørli 4444 is open six months a year: from April till September. 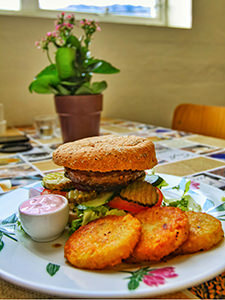 I stayed in Flørli Historic Hostel – a century-old villa with five bedrooms and 17 beds. Back in the times, it was a guesthouse for prominent visitors. Today, it is a hostel with a feeling of an antique home – with large communal areas, such as self-service kitchen and living room. Beware that you will need some basic fitness to come to the hostel building. It is situated 80 meters above the sea level; the uphill path from the ferry port is about 500 meters long! Radioshed houses a huge bed and nothing else, a true lovers’ nest! Besides the hostel, Flørli 4444 offers four rental apartments, the Director’s Villa and other Special Rooms with shared facilities (Post Room, Teacher’s Room, Doctor’s Room). Radioshed Mini-Suite is a particular glamping option, set in a former relay station for radio and telecommunications! 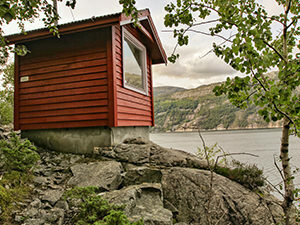 This 4-square-meters hut offers a large bed and a vast panorama window looking at the spectacular fjord; what else do you need for a romantic night with your loved one? Maybe wood-fired hot-tub? Available! It is also possible to camp here! Flørli camping spot on the flat meadow by the fjord costs 95 NOK per person (10 Euros). Accommodation with a real roof costs between 220 and 1600 NOK (23-168 Euros). To find the best available price, book Flørli 4444 through this link! What to eat in Flørli? Even if Oscar Zaalmink, the cook, will gladly prepare you a picnic basket for your first morning meal, Flørli 4444 is not just a simple bed and breakfast property. Café in the power station is actually a restaurant and offers locally inspired simple dishes throughout the day. The menu proposes homemade lasagnas, hotdogs, Norwegian fish soup, smoked, braised and cooked fish plates, hamburgers with reindeer meat! Dessert offer includes apple pie and blueberry cake. For those who wish to cook in the hostel kitchen, little kiosque sells basic supplies. This means you can count on simple pasta dishes, but also on some power bars for your Flørli hike! Wifi is also on offer in the restaurant area. If you want to stay connected with the world, you should know it’s open from 11 am to 7 pm. School-pub is open in the evening, only on Friday and Saturday, and they stop serving drinks at 11 pm. This wagon cannot bring you up any more. If you want to see the views from the top of the longest staircase in the world, you will need to climb them yourself! How to get to Flørli stairs? Flørli is located on the shores of central Lysefjord. There are no roads to the village! It is accessible only by ferry, by boat or by foot (the foot should be an experienced hiking foot!). There are two ferry services with four daily departures; always check Lysefjord ferry schedule in advance! Kolumbus ferry operates Lysefjord throughout the year (except on Saturdays). The ride from Flørli to Stavanger takes 1:45 hour and the price is 116,20 NOK (12 Euros). The journey from Flørli to Lysebotn takes 10 minutes and costs 48,14 NOK (5 Euros). If you are going from Lauvvik to Flørli, this ride will take you 45 minutes and cost 78,02 NOK (8 Euros). TheFjords ferry operates only from June till mid-September and offers its service as a sightseeing cruise for 360 NOK (38 Euros). If for some reason you plan to bring a car to Flørli (even if you cannot drive it there), know that the space on the ferry is limited, and it’s better to book beforehand, online! Disclosure: My stay at Flørli 4444 was complimentary, but all opinions are my own.